I am not a singer. I never sang in my high school or college choirs. I was too busy with debate, and band, and editing underground newspapers. But mostly I was a theater person. After my family moved from Vancouver to Utah, I found my first life-saving island of misfit toys at Palace Playhouse. 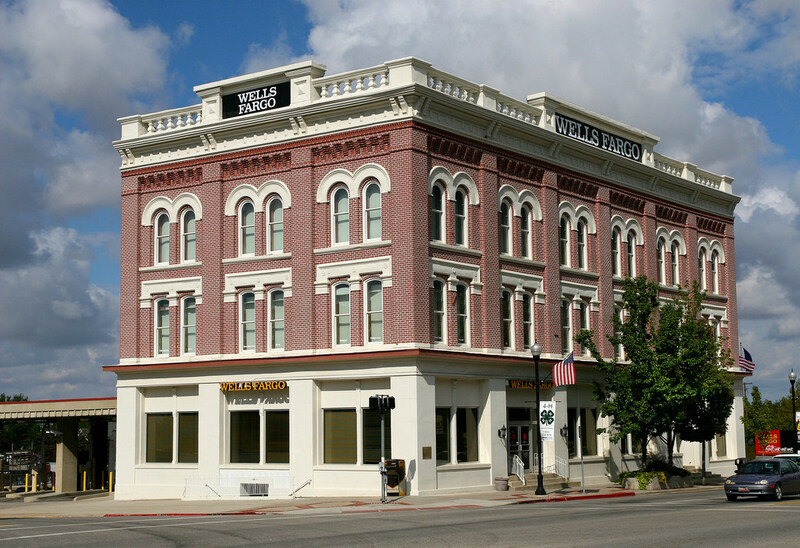 An over-enthusiastic drama teacher at Box Elder High School had somehow convinced the school administration and the owners of a historic bank building in downtown Brigham City to give us the use of the cabaret space on the bank’s top floor. 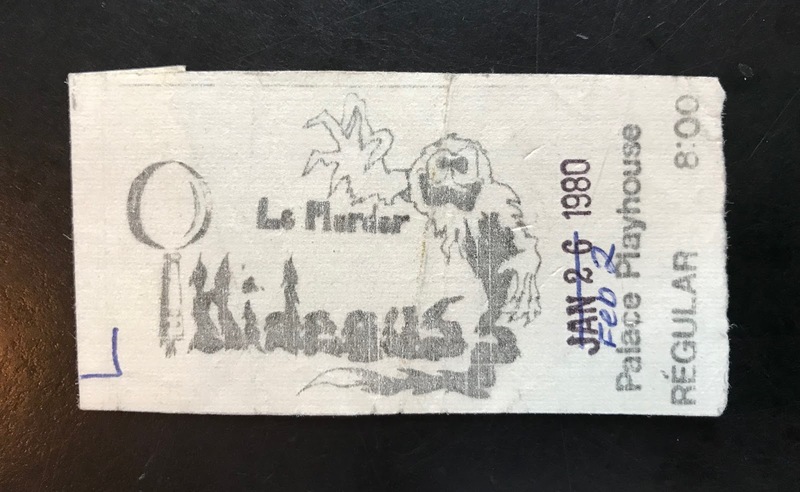 For decades, Palace Playhouse was a student-managed theater company that produced musicals and plays year round (until the principal and the fire marshal finally pulled the plug ten years ago). Palace Playhouse redeemed high school for generations of awkward BEHS grads. During the school year we spent first period at the theater working on the current production. We then convoyed across town to the high school and pretended to be normal-ish students for the rest of the day. It was like having a Bat Cave and a secret identity. On a practical level, Palace Playhouse offered an incomparable introduction to the whole fascinating business of theater, from building sets to marketing tickets, as well as the opportunity to perform in a wide variety of classic works. 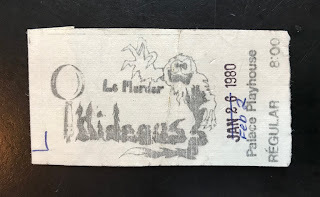 We even premiered original student plays, like the talented Mike Richan’s Le Murder Hideous. 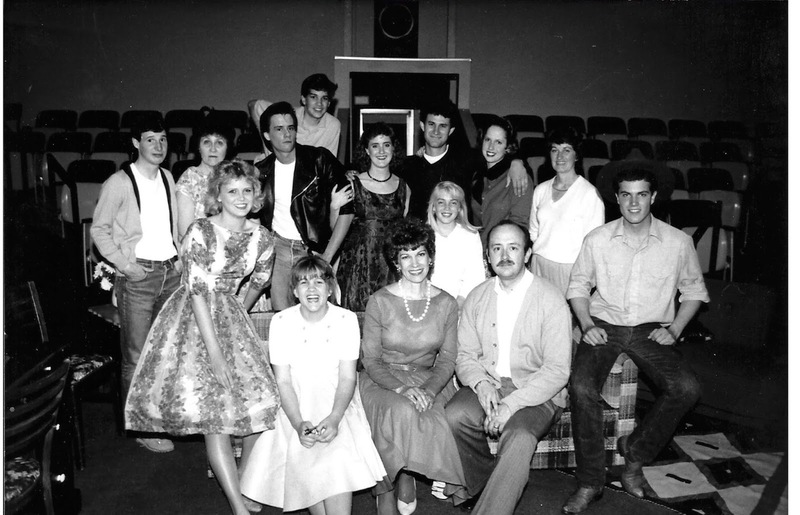 More importantly, even though we were all trapped in an oppressive Mormon farm town in the 1970s and 80s, Palace Playhouse gave us a safe space to explore quirky identities and intense friendships. This was long before anyone knew It Gets Better. Eventually. Not all the guys at Palace turned out to be gay years later, but everyone turned out to be creative, sympathetic, and interesting. My first big role at Palace Playhouse was Nicely-Nicely Johnson in Guys and Dolls, during the summer before my junior year. I wish I could find a picture of me wearing the garish rainbow-striped gangster suit my mother sewed. The next summer we did The Music Man. 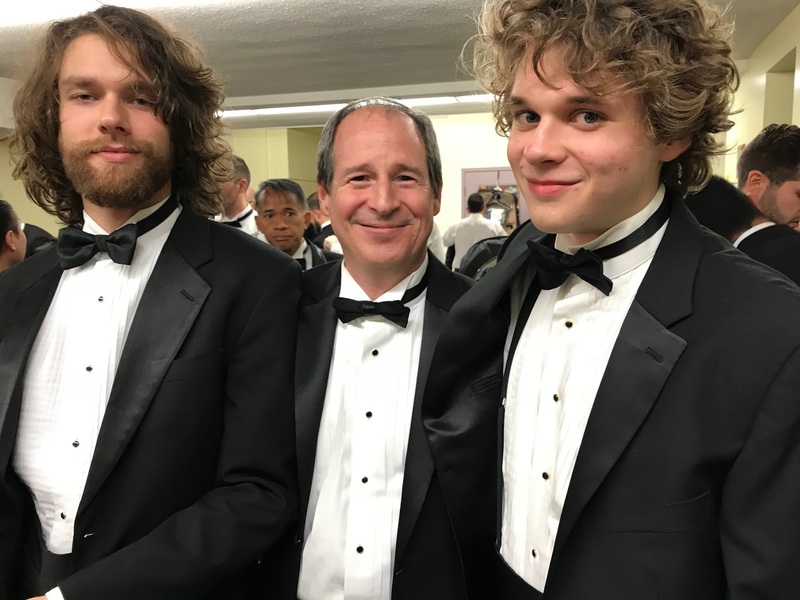 This time I music directed together with a classmate, and sang in the barbershop quartet. I also recruited my eight-year-old little brother Warren to play Winthrop, the shy boy with a lisp portrayed in the movie by a very young Ron Howard. According to family legend, the experience set back my brother’s speech therapy progress by several years. My parents moved from Brigham City to Bellingham a few months after I graduated from high school. However, the only time I ever lived in Bellingham myself – before starting my doomed job with the Attorney General’s Office as general counsel of Western Washington University – was during the summer between my freshman and sophomore years at BYU. Unable to find a temporary McJob in town, I spent my summer vacation doing community theater instead. Charlie Brown is the ultimate icon for any codependent person. The world keeps offering us irresistible footballs to kick, then pulls them away. 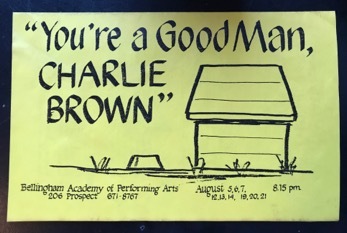 Obviously I couldn't turn down the title role in “You’re a Good Man, Charlie Brown.” I can still recite the play’s opening monologue thirty-five years later. In hindsight, channeling Charlie Brown for a summer was probably more debilitating than mimicking Winthrop’s lisp. Note that I also did the design and calligraphy for the play’s program. This was a regular thing during my youth. My vast collection of self-made certificates probably rivals Donald Trump’s – but I both earned and lettered all of mine, instead of just paying for them. After my Mormon mission to Korea, I returned to Brigham Young University to complete my bachelor’s degree in English, finish the coursework for a master’s degree in linguistics, teach freshman English, and start an independent student newspaper with another talented group of misfit toys. 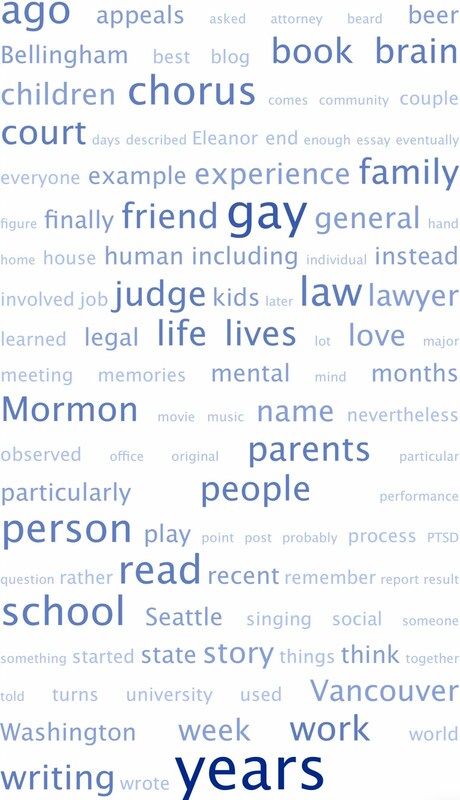 I also had my first nervous breakdown over the whole gay-and-Mormon thing. Like Carrie Fisher and Harrison Ford in Star Wars: The Force Awakens, I then waited until 2015 to reprise my greatest role. During law school, I performed in the chorus of the Yale Gilbert & Sullivan Society production each semester. In addition to being a fun outlet, G&S gave me the opportunity to mingle with interesting and diverse Yalies whose personalities had not been warped by law school. For example, our Divinity student choreographer now serves as the thirteenth Episcopal Bishop of Rhode Island since the diocese was founded after the American Revolution. 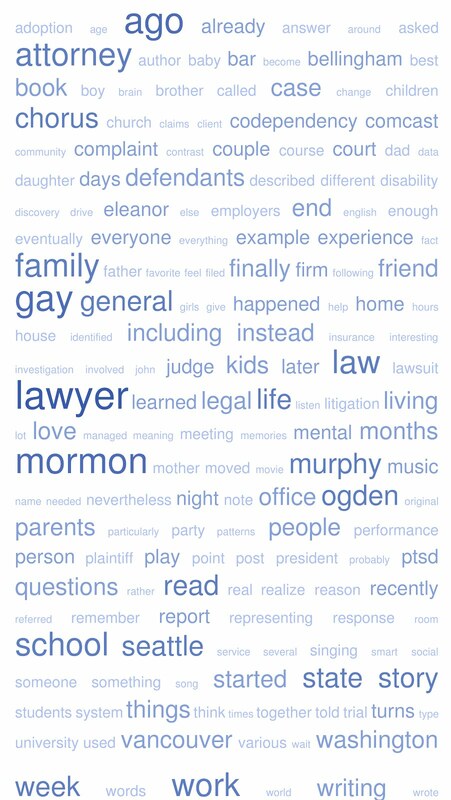 After graduating from Yale, I moved to Seattle to start my legal career. I knew I wouldn’t have the time and flexibility for theater. So I joined an excellent local choir, as a purely temporary artistic and social outlet. I ended up singing in the Saint Mark’s Cathedral Choir for six years, Windy City Gay Chorus for five years, and Seattle Men’s Chorus for fifteen years. 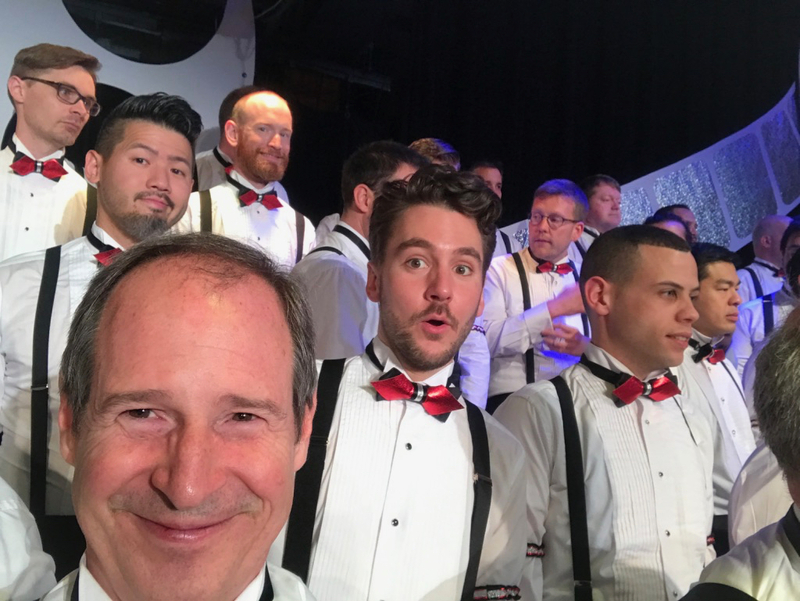 I’ve been singing with Vancouver Men’s Chorus for almost two years now – coinciding with the period when I’ve been dealing with Post-Traumatic Stress Disorder, impoverished unemployment, and the destruction of my career and house. Even though I often sang solos in character when I was in theater, I’m painfully shy, and terribly self-conscious about my singing voice. I've never even auditioned for a solo. I think of myself as an ensemble person, happiest when blending into gorgeous chords. I’m definitely not a Drama Queen like my daughter or certain of my Chorus brothers. (You know who you are. We all do, and we love you for trying out for all the solos so we don’t have to.) Instead, I pretend to be tall enough to hide in one of the back rows. VMC conductor Willi Zwozdesky is the first person with the nerve to put me up front. We are currently in the final weeks of rehearsals for VMC’s annual holiday concerts. I won’t bother giving you the hyperlink because tickets for all six shows are already gone. But you can still sign up on the waiting list for cancelations, or volunteer to usher – we’re forbidden from ever using the words “sold out.” Oops. Last weekend, the chorus traveled to Vancouver Island to perform outreach shows in Victoria and Nanaimo. It’s like taking a new musical to New Haven before opening on Broadway. You get to work out the kinks, and you reach an appreciative new audience in the hinterlands. It’s also a fun opportunity to socialize with singers from other sections, away from the hurried scrum at rehearsal. I loved riding on buses and ferries and staying in a hotel with the gang for the first time. Even though social anxiety had me hiding under the covers in my room on Saturday night while everyone else was at the cast party. Next we needed someone to tell the audience “It’s not fair if you’re Jewish!” Without thinking, I pointed out I can easily play Jewish, and got the part. Later I remembered PTSD is still a whole new adventure for me, and I realized there was a significant chance that I would freeze when the time came to sing my four nebbishy lines. Still, as you can tell from all the blog posts this year, I’ve been making progress with my disability. And I need to push myself. Fortunately, the performance went smoothly. Unfortunately, four hundred nice blue-haired ladies and twelve cute gay guys in Victoria have now joined the vast throng of people who labor/labour under the misapprehension that I’m Jewish. It’s impossible to escape type casting. This is the happiest. I can't remember you ever freezing. You were and are an amazing person Rodger! Thank you for the walk down memory lane. Sing on! Sing On!